ON the eve of the July 30 harmonised elections, former President Robert Mugabe did something peculiar. He called an international Press conference and spoke for over 90 minutes in which he denounced President-elect Emmerson Mnangagwa and endorsed MDC Alliance presidential candidate Advocate Nelson Chamisa, while saying nothing against Zanu PF as a party. This was peculiar for a number of reasons. Firstly, his last-minute endorsement was too late to have any meaningful impact on the outcome. Mugabe is a capable student of politics and was not naïve to this reality. 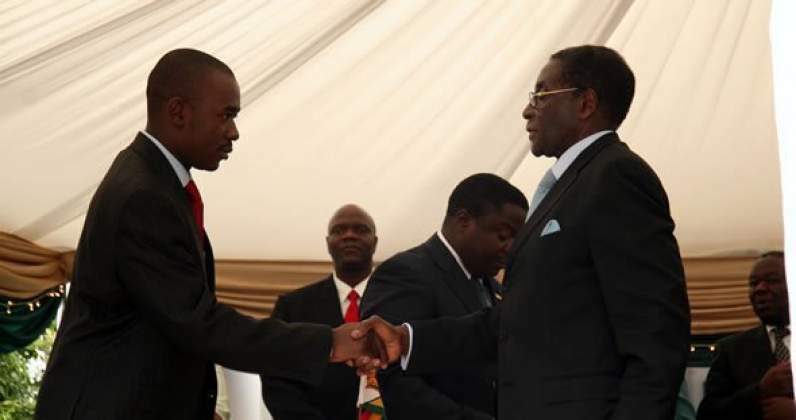 Secondly, if Mugabe’s real objective was to assist Chamisa, he would have done exactly what Zanu PF feared by actively campaigning in Mashonaland. He did not. In all this, Mugabe’s age cannot be ignored. While he aspires to a hundred, nature may decide otherwise. Why would a highly experienced political operator in the twilight of his life and with a politically vulnerable family, decide to provoke a political tiger? It does not make sense unless he knows the tiger is made of paper and a matchstick is about to be lit. This is speculative. The objective political question is what Mugabe was trying to do; that is the objective of this brief article. Some background issues are essential in understanding the rapid collapse of the Zanu PF security power matrix and Mugabe’s sophisticated dog-whistling. Mugabe does not need to phone anyone; his sheep know his voice. The Bulawayo bombing is now accepted to have been an inside job. The Independent newspaper extensively reported on the matter and detailed how senior police investigators were deeply frustrated by the military’s refusal to release the prime suspect into their custody. The arrest and torture of two Bulawayo men, who were later released without charge, was a cruel ruse. Everyone knew those two unfortunate men had absolutely no involvement in the matter. It is significant that Mnangagwa’s spokesperson, George Charamba, attributed the attempted killing to “unresolved leadership issues”. He was not talking about G40, which was operationally incapacitated in November 2017. This significant assassination attempt and the refusal by the military to release a suspect into the custody of the police points to deep schisms in the security power matrix. Also significant is the brief arrest of former CIO deputy director, Tadzingaira Tachiveyi. He was released the same day. His arrest, as well as mindless allegations that Grace Mugabe was cooking up a treasonous plot to oust Mnangagwa, points to malicious disinformation and mischief in the intelligence apparatus. The harmony is gone and desperation has crept in. Another helpful background issue is the persistent claim that there is a plot afoot in Zanu PF to dislodge Mnangagwa via impeachment. Soon after taking power, Mnangagwa publicly railed against alleged impeachment plotters. Following his wafer-thin and now hotly contested victory on July 30, he repeated the same claim. It is not a trivial thing for a President to claim on two separate occasions that members of his own party are plotting to unseat him. A plot has a leader. Who is Mnangagwa claiming to be the mastermind behind this plot? One also notes that whoever organised the Zanu PF parliamentary victory, which is also in legal dispute, decided to leave Mnangagwa out of the party. While Zanu PF scored big in Parliament, Mnangagwa is battling to save a desperate 0,8% victory that is quickly shrinking following “clerical error” concessions in the Zimbabwe Electoral Commission (Zec)’s opposing papers. What is apparent from the above incidents is that Mnangagwa is battling to establish full control of Zanu PF and the security power matrix that he snatched from Mugabe in November 2017. Intelligence and politics are a complicated affair. Simply firing a senior intelligence officer does not stop him being friends with former subordinates and colleagues. Information still moves, even without the office. At Zec insiders have been leaking information at an unprecedented rate. Mnangagwa is aware of this problem and has been ruthlessly purging senior police and intelligence officers, choosing reliance on the military for protection. The problem for Mnangagwa is the military is alleged to have the bombing suspect in their custody, who are they really protecting? Perhaps not him. If Mnangagwa is inaugurated he will completely annihilate all remaining pockets of Lacoste unbelievers, even the lukewarm will not be spared. Mugabe’s message to them on the eve of the election was very clear: Do not fight Chamisa. We will be better off with him in power. The gathering of evidence that followed the rigging of the July 30 elections suggests that the system has listened. It was clear that hands deep in the intelligence apparatus were releasing information to journalists and the MDC Alliance. Does this Mugabe telepathy end there? The question one would have to ask is if Mnangagwa has any influence over the judiciary? He has claimed so himself in a self-congratulatory tweet in which he boasted that he had intervened to have Tendai Biti released. Now, if Mnangagwa, who has been in power for barely nine months, can make such boasts, the question is does Mugabe have any residual influence on the justice system? But Mugabe’s may no longer be required. The judiciary is the international spotlight on this particular case. The involvement of esteemed advocates from around the world means this judgment will be deeply scrutinised as a measure of the rule of law in Zimbabwe. No investor will jump into bed with a government that can brazenly intervene in judiciary processes to induce an irrational and patently unjust ruling. What is to stop that same court allowing a political take-over of lucrative mining claims? Many of these questions will remain a matter of speculation, but what is clear is that Mugabe has sent a clear signal to his people — follow Chamisa.